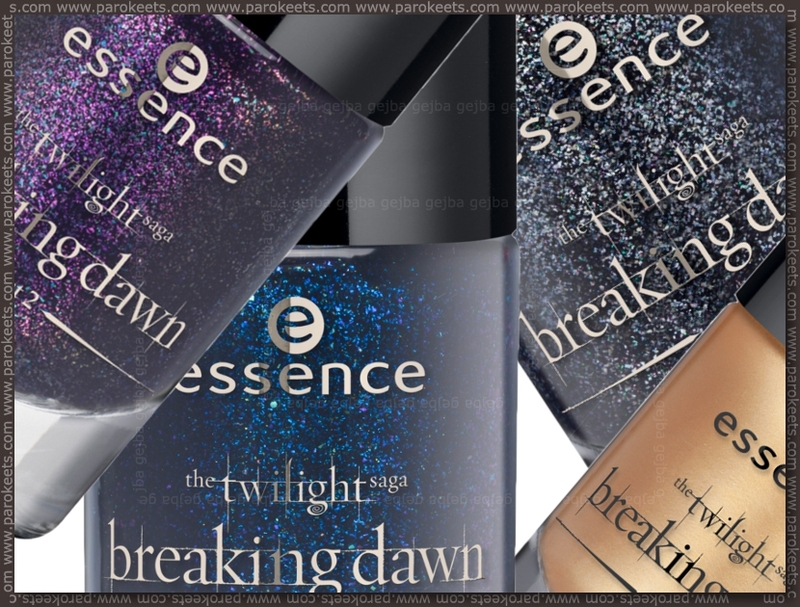 And nail polishes (2,19 EUR) in Essence Breaking Dawn TE are looking promising so far … 3 out of 4 at least. 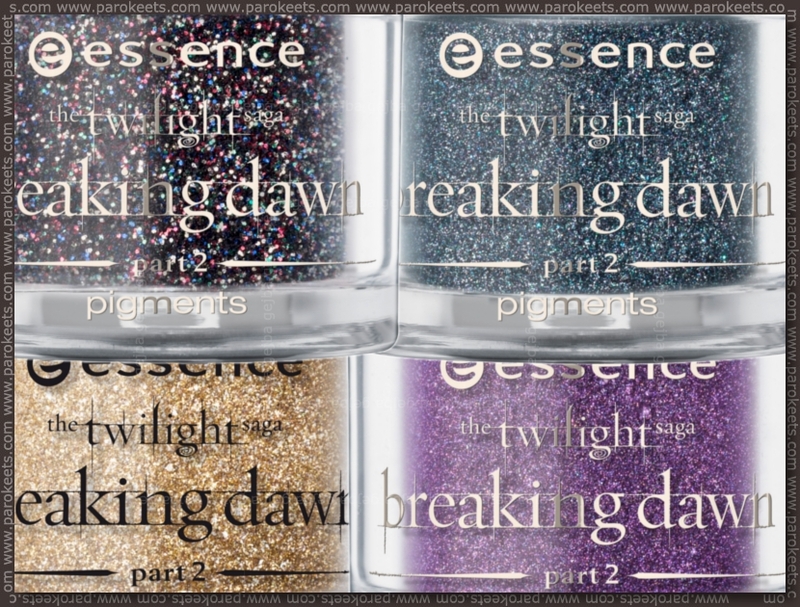 This time we’re getting 4 shades with appropriate names: 01 Jacob’s protection (blue), 02 Alice had a vision – again (purple), 03 A piece of forever (gold), 04 Edward’s love (black). I just hope they won’t be too similar to Vampire’s Love TE shades. No eyeshadow palette this time, but 4 pigments (2,69 EUR) are good replacement in my book. Judging from promo photos, blue and gold are something I may like, but glittery one also looks like potentially fantastic top coat. 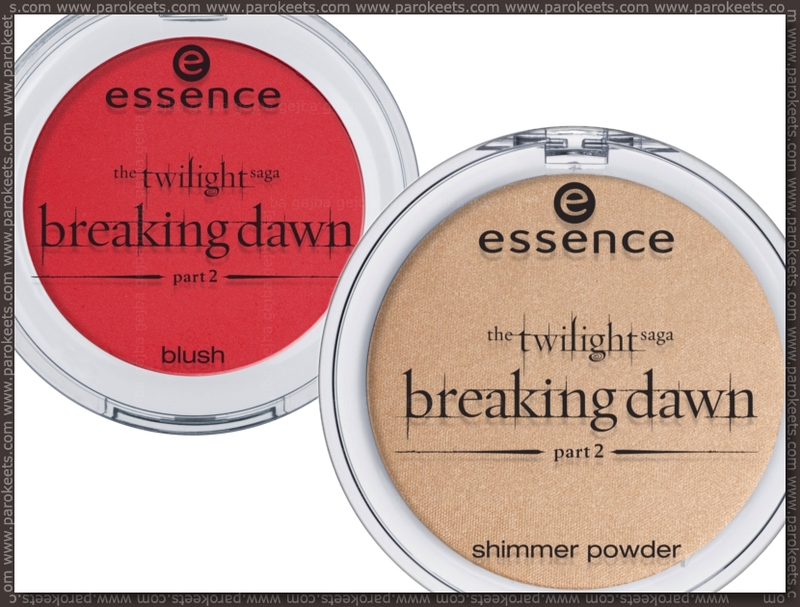 Renesmee red blush (3,09 EUR) is another product that caught my eye – interesting shade I’m pretty sure I don’t have + it does not look too shimmery. Keeping my fingers crossed it doesn’t turn out pink with loads of shimmer. Shimmer powder (3,29 EUR) on the other hand is probably to shimmery for me as powder, but they do sometimes make lovely highlighters. Available in one shade – Bella‘s secret. 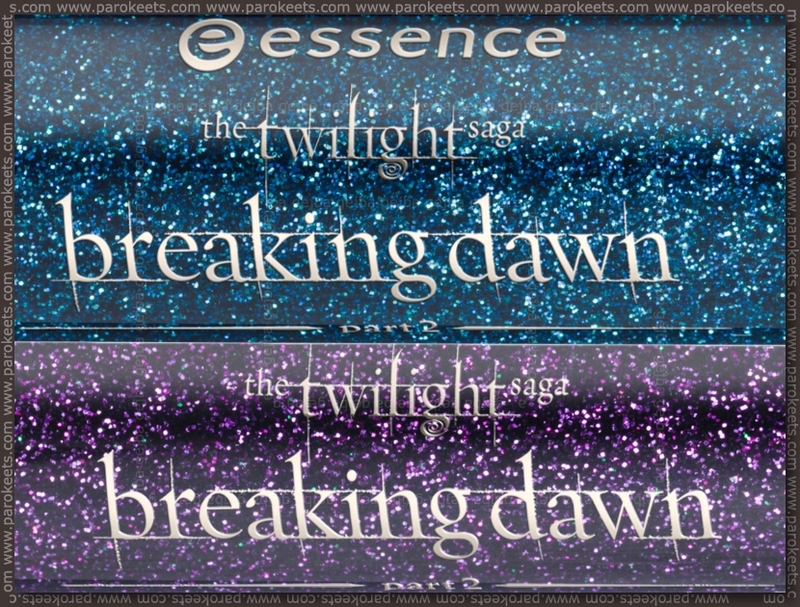 There is only one lipstick (2,69 EUR) in Essence Breaking Dawn TE – shimmery gold one called A piece of forever. 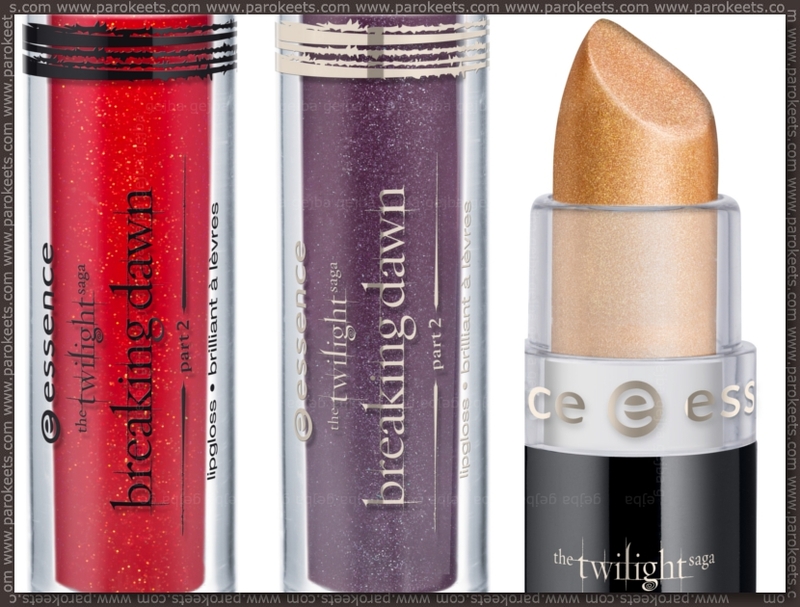 And to round up lip selection Essence added two shimmery lip glosses (2,19 EUR) – Alice had a vision – again, Renesmee red. Last two items are liquid eyeliners (2,49 EUR). Essence is promising us thin brush and precise application. 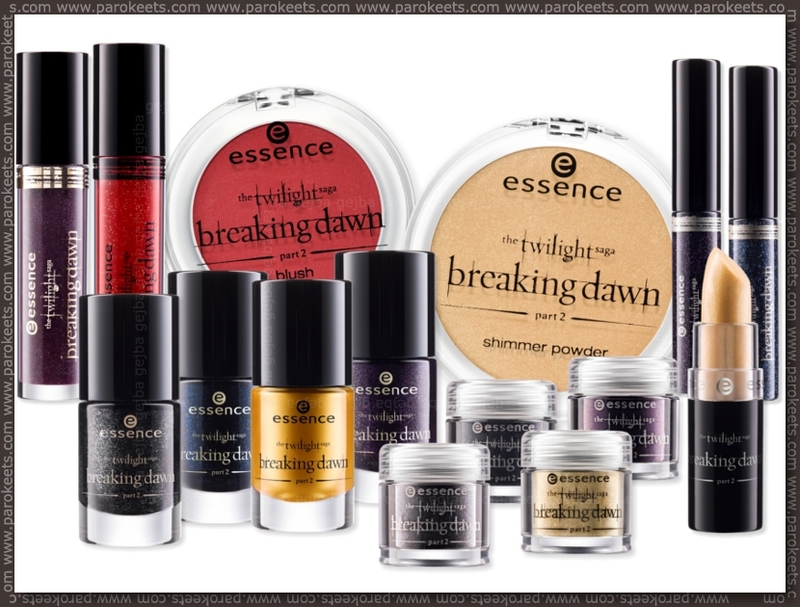 Anybody else excited about Breaking Dawn TE? What will you be getting? LOL – očitno nas kar nekaj ni navdušenih nad zlatim lakom. Na srečo bo vsepovsod na voljo, tako da bomo verjetno vse dobile kar si želimo. Pri lakcih sem pomislila na isto kot ti, da so zelo podobni lakom iz Vampire’s Love kolekcije. Ampak od blizu na promo fotkah moder in vijoličen izgledata prav zanimiva. Še pigmenti so me pritegnili. Bomo videli, kakšna bo ta kolekcija v živo. twilight me sploh ne zanima, ampak so mi lakci zelo všeč!